Although known as the world’s largest 3on3 basketball tournament, Hoopfest Weekend is also a family-friendly, community-driven event. While you might think, it’s all fun and games, competition was high across our #Hoopfest2018 site, especially on Nike Center Court and our Moss Adams High School Elite Center Court. 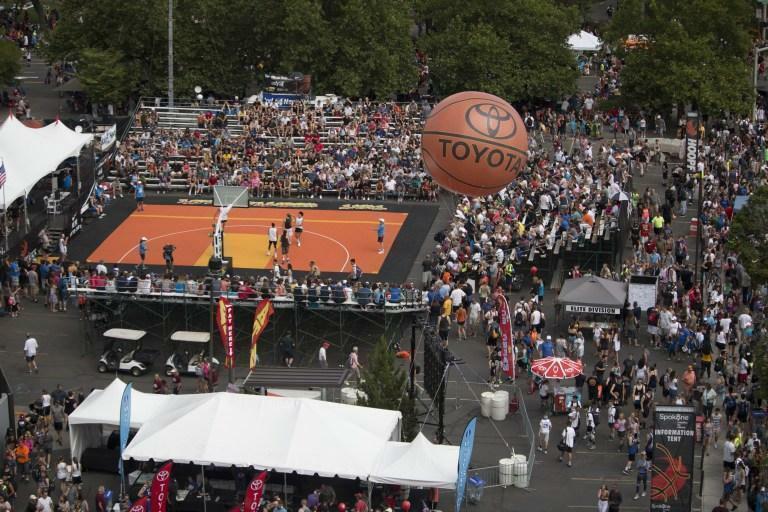 Nike Center Court is home to Hoopfest’s Elite Divisions presented by JBL/Huppin’s. With a high level of playing experience, the hoop action on Center Court is electric; from long-range three’s to stifling defense, competitiveness is in full force. As in any game, there can only be one team standing at the end. From our Elite Divisions, we would like to congratulate the following adult teams on their grind to becoming the Champions of their Court. The champions from our High School Elite Divisions can be found here! If you want to see each team’s journey to the championship, click on the link following the team name to take a look at their bracket. The defending champions were back for 2018. The 6-7 Marc Axton was an All-Conference selection at Eastern Washington University before playing professionally overseas. Robert “Big Shot” Lippman was a Second Team All-State player at Northwest Christian School, before stellar careers at Spokane Falls Community College and Northwest Nazarene University. The quartet enjoyed professional stints in Europe, Australia and Japan. Mike Hart became a fan favorite at Gonzaga because of his effort on the floor. The 6-6 guard was named the 2013 Defensive Player of the Year by the West Coast Conference. Parker Kelly enjoyed a stellar career at Eastern Washington. The Spokane native scored over 1,000 points at EWU, making 210 three-pointers. Two professional players and two collegiate players makeup this tough foursome. Brian Johnson and Marcus Bradford enjoyed semi-pro careers. Johnson is listed at 5-10, while Bradford is 5-11. Michael Johnson was one of the most decorated basketball players in Washington prep history. He moved on from Ballard High School to the University of Washington. 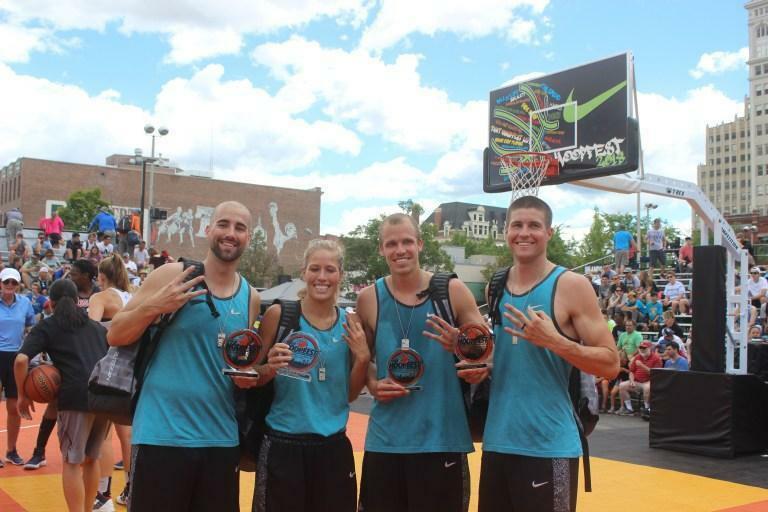 The quartet brought tons of coaching and training experience to Hoopfest. They made the trip from the Seattle area, where they all have been coaches and/or trainers. Darrell Murphy played at North Seattle CC. This quartet are some of the best high school players in the country. They just won the 2018 USA Basketball 3×3 U18 National Championship. Samantha Brunelle, the No. 1 prospect in the espnW HoopGurlz Super 60 for the 2019 class, committed to play for Notre Dame. A 6-2 forward from Stanardsville, Virginia, Brunelle is already a two-time medalist for USA Basketball. She averaged 30.0 points and 15.6 rebounds a game as a junior. Aliyah Boston was the 2017 and 2018 Gatorade Massachusetts Player of the Year. She averaged 21.2 points per game last season, and ranks eighth in the country as a recruit by espnW. Paige Bueckers averaged 22.3 points, 6.8 assists and 5.9 rebounds per game this past season at Hopkins High School in Minnesota. She was tabbed the 2018 Gatorade Minnesota Player of the Year. 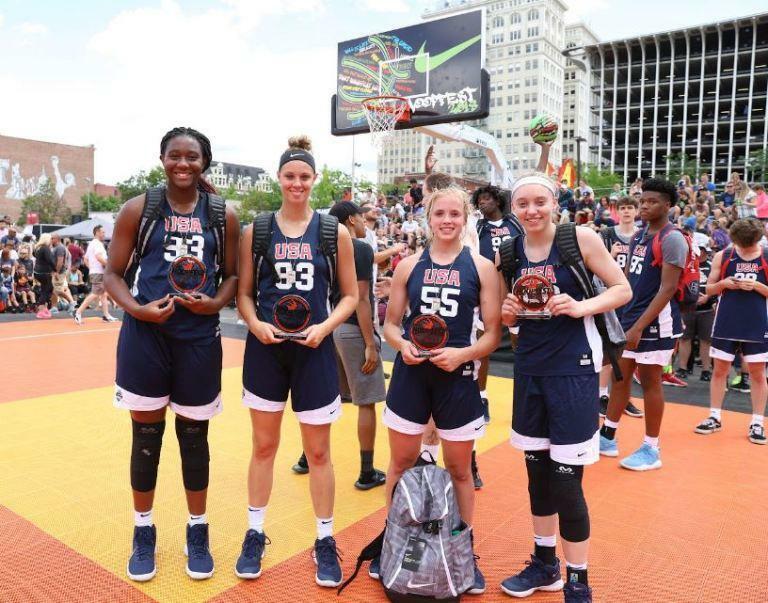 Hailey VanLith was the 2018 USA Basketball 3×3 U18 National Championship MVP. The Wenatchee, Wash. native was named WIAA All-State Class 1A first team in 2017 and 2018. The two-time defending champions were back to defend their title. The Dorr’s traveled from Arizona, while the Ryan’s came from southern California. The Dorrs are both 6-4, Andrew Ryan is the tallest on the team at 6-5 and Brianne is 5-10. Andrew was a constant deep-threat at NCAA Div. 1’s Campbell University from 2010-14. Brianne played at nearby Eastern Washington, where she was an All-Big Sky performer. Matt moved from Spokane Community College to the University of San Diego, where he was a key member of the team and graduated in 2011. Mike was a three-point specialist at Carroll College in Helena, Mont. Nike Center Court once again impressed Hoopfesters with great hoop action and displayed player’s competitiveness, grit and determination. If you’re looking for our younger, just as impressive champions, check out our blog exclusively on the High School Elite Champs! 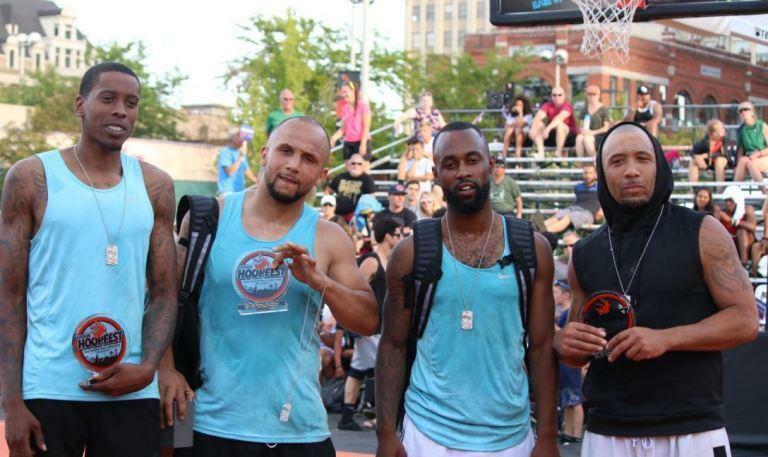 #Hoopfest2018 was full of exciting elements and activations, but that didn’t take away from the 3on3 streetball. 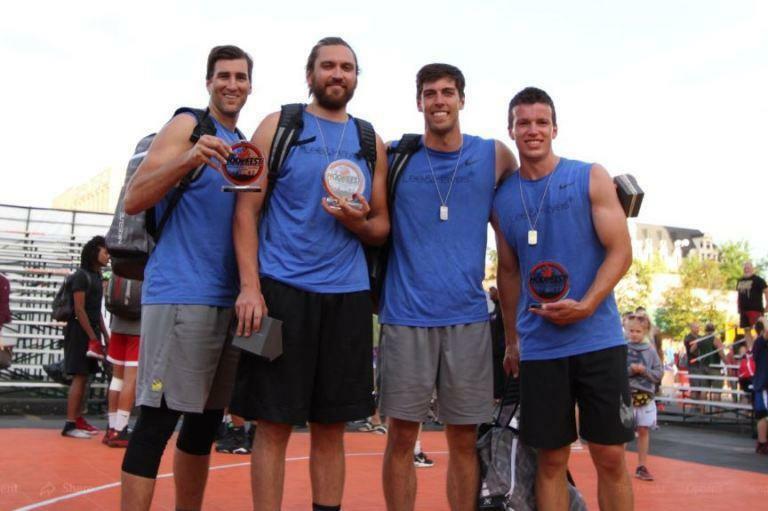 We would like to once again congratulate the winning teams of our JBL/Huppin’s Elite Divisions. Join us on the streets of Spokane for #Hoopfest2019 – June 29 & 30, 2019.